The return to the spotlight of Journey’s best-loved singer is every bit as revelatory as the Eagles agreeing to forgive and forget, Bowie’s clandestine recording of the Blackstar album and the surviving members of Led Zeppelin playing a little shindig at the O2 Arena. In the almost two decades since a hip replacement precluded him from touring with Journey for their 1996 album Trial By Fire, Steve Perry dropped off the radar. He had fallen out of love with music. Post-Journey, Perry felt “like a wrungout sponge”. Gradually, though, he poked his head back above the parapet, joining the Eels at a couple of gigs in 2014. 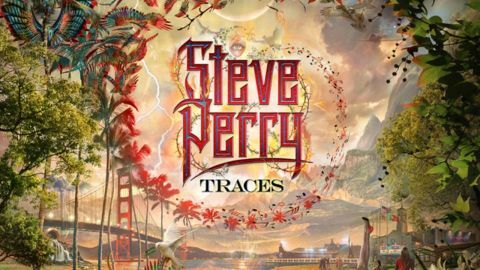 The resulting furore saw current incumbent Arnel Pineda offer to step aside should Perry fancy rejoining Journey, though Steve insisted he was “just having fun”. Those words were crucial. Perry had rediscovered his mojo via a tragically short-lived relationship with a soulmate who would succumb to breast cancer. On her deathbed, Kellie Nash made him promise to end his isolation by sharing the songs he had written for and about her. Perry broke the news of a third solo album 24 hours after teasing fans with the sudden activation of his social media pages. The opening line of its lead-in track No Erasin’ says it all: ‘I know it’s been a long time comin’.’ Rumours of the complete disintegration of the 69-year-old’s voice had been rife, but with the soulful aspect of his delivery replacing the tonsil gymnastics of yore, he sounds absolutely fine, if less of a show-off. Mostly, though, Traces triumphs due to the sheer quality of its material. Those who appreciated its predecessor, 1994’s For The Love Of Strange Medicine, will find much to wallow in here. However, should you expect a new millennial reboot of Journey’s Raised On Radio, well… you’d better turn the page now. Including a remake of George Harrison’s I Need You, the album is done and dusted within 40 sumptuous minutes. By turns maudlin and celebratory, saccharine and spiritual, the elephant in the room is the overwhelmingly sedate pace of these songs. Five of them saunter before Sun Shines Gray dares to break into a gentle gallop. However, without exception they are mesmerising. Patience has been rewarded. Another solo tour, let alone a return to Journey, is surely quite impossible. Then again, this time last month, how many of us would seriously have placed money on Perry making a record as extraordinary as this?